We have received emails from many of our regular readers that they would like to see photoblogs more often. So, here is a photoblog with pictures from the Jokulsarlon glacier in South Iceland. 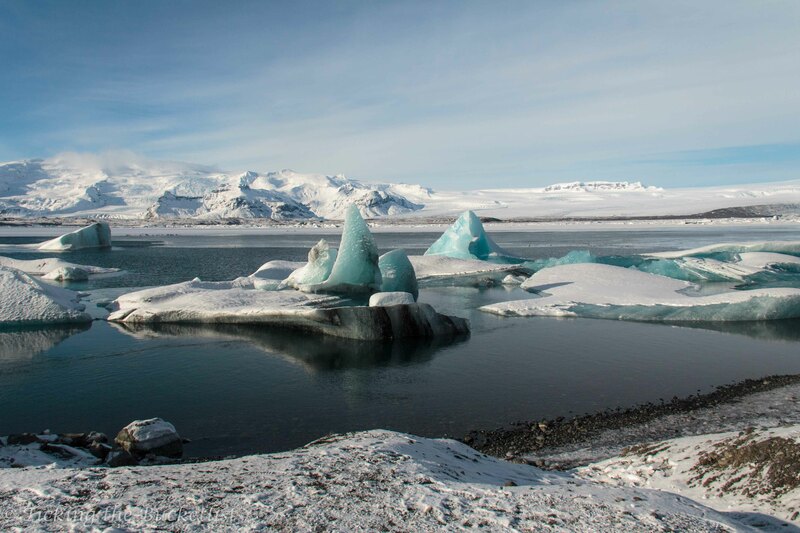 Jokulsarlon, literally translated means ‘glacial river lagoon’. The vast Vatnajokull glacier melts to form the lagoon, with masses of crystal blue glacial ice. In summers, it is possible to take a boat to get closer to these floes. We were at Jokulsarlon during the chilly winters and had to be contended by admiring them from a distance. 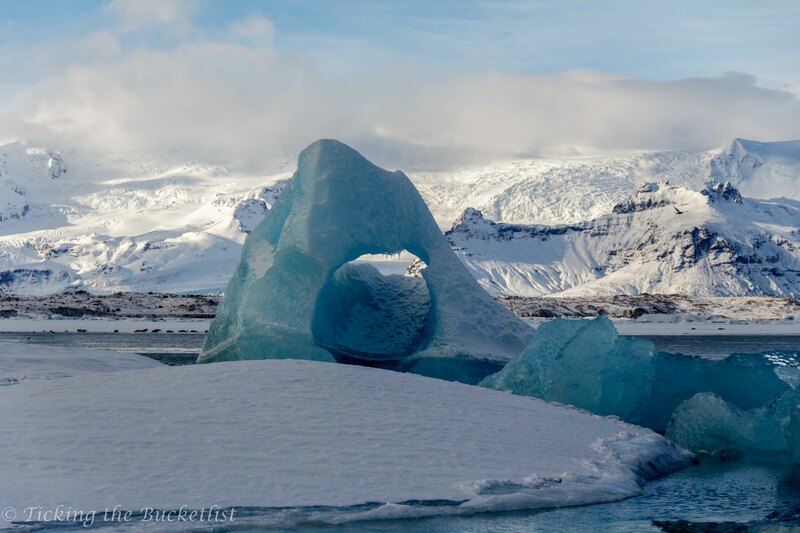 While I have shared this picture on our blog post on Vatnajokull Glacier, I can’t leave it out in this post – it’s the quintessential picture for any post on Jokulsarlon. This floating mass of ice reminded me of the shape blocks that I played with as a little child… the pyramids, cylinders and rings. This seemed like a similar block that Mother Nature had dropped during one of her games. There is a popular Icelandic saying, ‘If you don’t like the weather, wait for five minutes. It will change!’. We watched the weather change from sunny to cloudy to a fierce bout of flurries in a matter of minutes. The Jokulsarlon Glacial Lagoon opens into the sea that has black volcanic sand, characteristic of South Iceland. 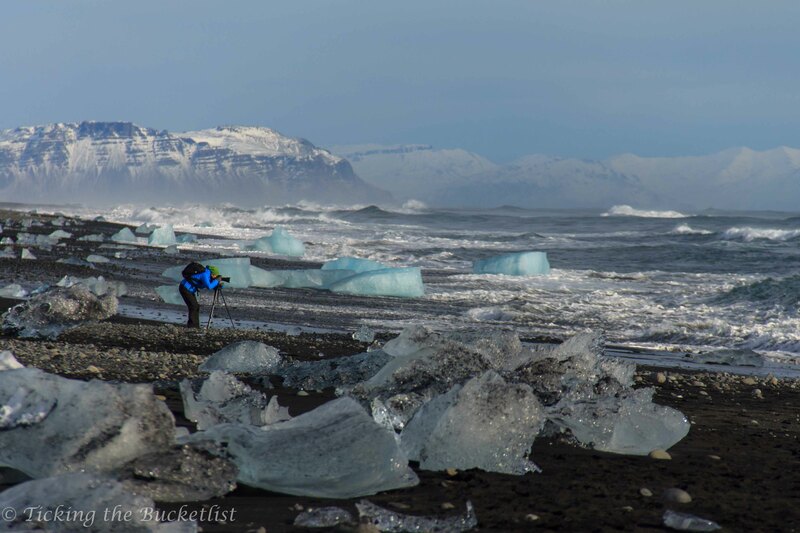 We had never seen such chunks of ice on a sea shore – a photographer’s delight. It was interesting to see the effort that this young lady took to get the perfect shot… until a big wave came and filled her boots with ice cold water. The ocean isn’t kind to anyone! 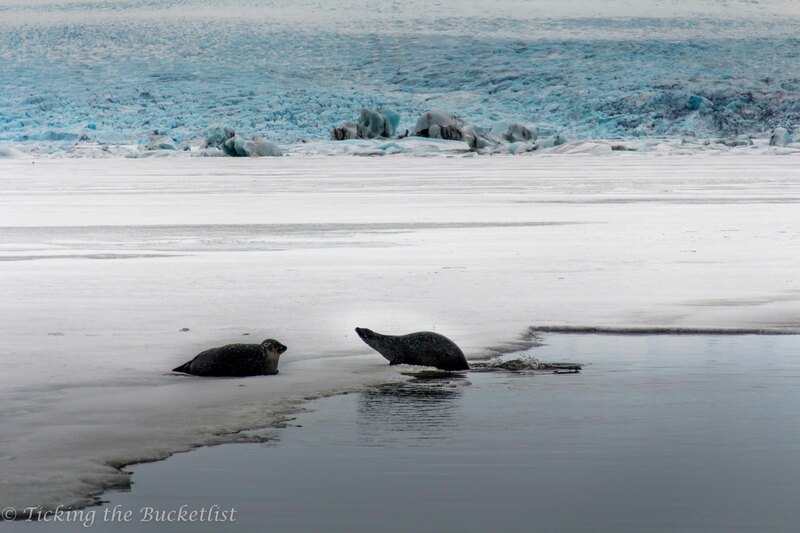 The Jokulsarlon Glacial Lagoon is home to a huge seal colony. There were caring mamas, angry young men and playful puppies. However, what caught our eye was this couple, a little away from the rest, romancing against the backdrop of the crystal blue Vatnajokull Glacier. Valentine’s day …its in the air! 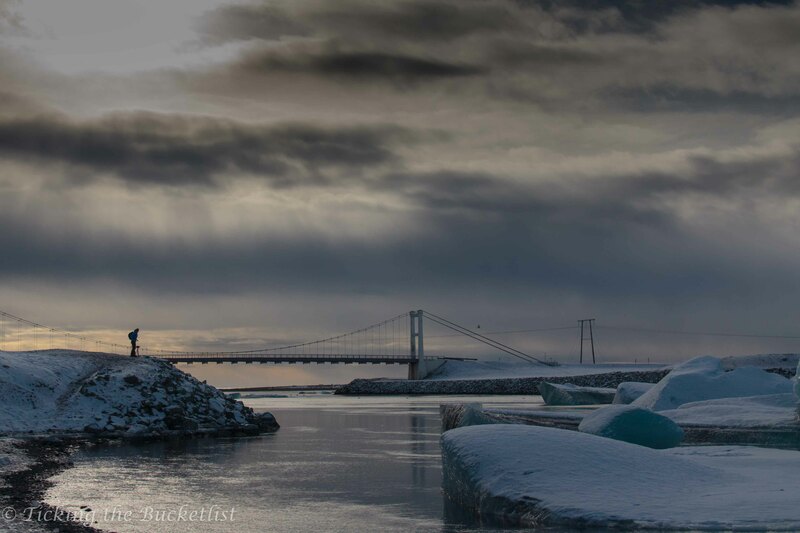 Jokulsarlon has hosted action sequences from Lara Croft, James Bond and Batman. Game of Thrones fans… have you seen it any of the episodes? Thanks Niranjan! Iceland truly is beautiful. Jokulsarlon is so beautiful! I really, really need to get myself to Iceland! Good job with the photos – love the photo essay! Ah Jokulsarlon, isnt this a place full of magic? We made a roadtrip Iceland last year and of course also stopped there. Just breathtaking. Your photos are truly great, I like a lot since they give a very good understanding and catched the spirit of this place. Thanks for bringing back the memories! Wow this place looks stunning! The ice blocks look fantastic! I really hope to visit this place soon! How something can be so beautiful?! I am completely sold on Iceland! How many days would you recommend for a nice tour around the island? Hi Maja! We would recommend at least a week, preferably 10 days to enjoy this beautiful country. We have a 6 day itinerary on our blog…do check it out! What beautiful images! I love the first one you took in Jokulsarlon. I have never heard of this place before and now I want to go! These are utterly gorgeous! I love the photo of the seals. And all that snow. Jokulsarlon is stunning. You have some very inspiring photos. The range of colors in the ice is amazing.